When you have your heart set on a new mantel, SoCal Fireplace Mantels offers a huge selection of stone fireplace mantels in Orange County. Once you find just the right mantel, you want to be sure to take proper care to keep it clean and prevent damage. While decorating the mantel is popular, stone can chip or crack if not cared for properly. Be sure to use a protective covering on your mantel and underneath any objects that you place on the mantel. Protective mats, coasters, and doilies can help prevent sharp or heavy items from damaging your mantel. Do not set drinking glasses on the mantel without using a coaster to prevent water ring stains or moisture damage. To keep your mantel looking great, regular dusting is a must. Dusting with a rag can push dirt and grime into the natural grain of the stone, resulting in darkening of the look of the stone. Instead, choose a duster that is specifically designed to attract dust away from the stone. Heavier dirt may be removed with a rag dampened with gentle cleaner and water and stains with a baking soda paste. Rinse repeatedly with a rag dampened in clean water to remove all residues. You may also remove some stains with a dampened cleaning eraser used according to the included provider instructions. 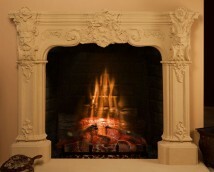 SoCal Fireplace Mantels, provider of all kinds of fireplace mantels in Orange County, can answer any questions about proper care for your mantel.